Did you know that March 23rd is National Puppy Day? I didn’t, but I feel like I’m always the last to know about these things. I’m not sure if you know but we used to have a justaBXdog named Soul. He was a beautiful pitbull and the ultimate nanny dog. My dad had Soul from the time he was a puppy. He lived a full and happy twelve years and we recently had to put him down. We’re still recovering from the process so anything having to do with dogs is a sensitive subject around our home. Recently JustaBXgirl has been asking about getting a new dog. Truth be told Soul was part of the family. He ceased being a dog in our eyes a very long time ago. I’m also not a big pet person. I have enough trouble remembering to feed myself and JustaBXgirl (I remember to feed her much more often than myself) much less do I want to take on the responsibility of a new pet. Thank you to Peppy Pups for finding a great compromise. This plush puppy is just the thing that makes the perfect pet for a preschooler. (Say that 5 times fast!) The puppy when pulled by it’s owner can walk, run, jump and wag it’s tail! It can even move it’s head. 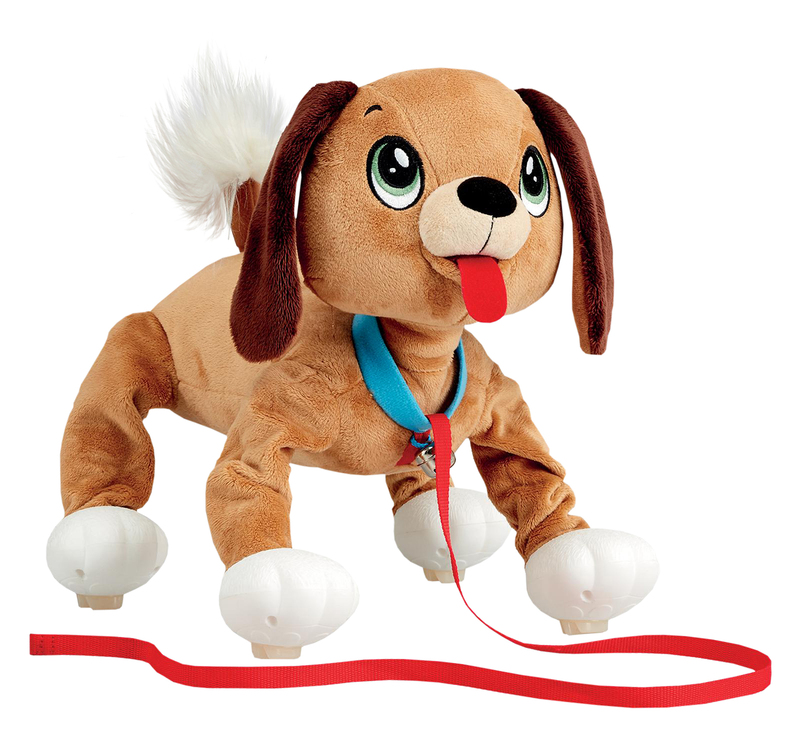 Children will love this pup and if you are thinking of getting a real dog this is a good transition toy for your child (and maybe you). Oh, and there are no batteries required. This is fully fueled by your child. I’m know that JustaBXgirl will be excited to find her own Peppy Puppy under the tree as her gift from Santa (aka TPF Toys). Wait until you read my blog on why Santa only gets credit for one gift! We received this for review purposes. As always opinions are honest and those of mine and JustaBXgirl. Don’t mind the mess in the background. Santa’s elf had to take the photo quickly. If you’re looking for a plush toy that does more than just sit there then this is it. If you’re looking for a toy that can keep your child entertained for some time then this is it. If you’re looking for a practice pet then this is it. If you’re looking for a real pet and what better day to do it than national mutt Day then visit a local animal shelter and bring home an animal in need of a loving family.